Publ. Field Mus. Nat. Hist., Bot. Ser. 22: 3. 1940. TYPE: Costa Rica. Alajuela: Villa Quesada, San Carlos, altitude 800 m, Valeria 17 26 (F-933729, holotype). Epiphyte; stem scandent; internodes elongate, 2-15 cm long, 2-3 mm thick, covered with corky, lenticellike tubercles; cataphylls absent. 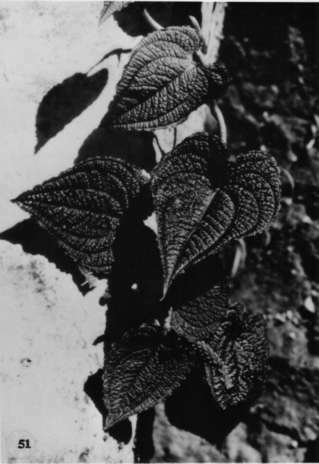 LEAVES spreading; petioles 2-5.5 cm long, sheathed half their length or less, the base encircling the stem, narrowly flattened with a medial ridge adaxially, faintly multi-ridged abaxially; geniculum less than 5 mm long, weakly luberculate; blades ovalc-cordate, bullate, chartaceous, acuminate at apex, lobed at base, 7-14 cm long, 4-9.5 cm wide, broadest 1-2 cm above point of petiole attachment; the anterior lobe 6-11 cm long; the posterior lobes rounded, 1-2 cm long; the upper surface matte; basal veins 4-5 pairs, sunken above; the lower surface paler; collective vein arising from the first basal vein. INFLORESCENCE spreading; peduncle obscured by base of spathe or rarely to 5 cm long; spathe green, lanceolate, ca. 5 cm long, ca. 1 cm wide; spadix purplish, 4.2-6 cm long, 5-7 mm diam. at base, 3-4 mm diam. at apex: the flowers rhombic to 4-lobed, 5.3 mm long, 3.5 mm wide; 3-5 flowers visible in the principal spiral, 4-5 flowers visible in the alternate spiral; tepals semiglossy; pistil weakly raised; stigma puncliform, ca. 0.6 mm diam. INFRUCTESCENCE spreading-pendent; berries orange, obovoid-oblong-ellipsoid, (5)8-9 mm long, 4-6 mm wide, drying dark maroon; seeds (1)2-6, obovate-elliptic, flattened, brown or black, 7 mm long, 3.5 mm wide. Fig. 51. This species is known from the Atlantic and Pacific lowlands of Costa Rica in tropical wet forest from sea level to 800 m elevation. Anthurium clidemioides is placed in section Polyphyllium (Croat & Baker, 1978) and is easily one of the most distinctive species of Anthurium due to its bullate leaves and near absence of a peduncle. In its sterile state, it could be mistaken for species of Piper, Dioscorea, Pileu, or even some Melastomataceae. Costa Rica Alajuela:, , Valerio 1726 (F). Costa Rica Heredia:, , Hartshorn 939 (MO). Costa Rica Heredia:, , Moore 9998 (BH). Costa Rica Heredia:, , Opler 2091 (F). Costa Rica Lim—n: 20-170 m, 10.41N 83.38W, 15-20 Sep 1986, Warren Douglas Stevens 24526 (B, MO). Costa Rica Lim—n: 12 m, 10.38N 83.45W, 20 April 1990, Michael Grayum 9774 (MO). Costa Rica Lim—n:, , Davidson & Donahue 8735 (MO). Costa Rica Lim—n:, , Davidson & Donahue 8824 (MO). Costa Rica Lim—n: R.N.F.S. Barra del Colorado; Llanura de Tortuguero, 15-20 m, 10.38.38N 83.44.10W, 20 April 1993, Flor Araya, N. Zamora & J. Corrales 231 (CR). Costa Rica Lim—n: Llanura de Tortuguero, 50 m, 10.29.48N 83.47.09W, 17 May 1995, J.F. Morales, E. Lépiz, A. Rojas & G. Dauphin 4213 (CR). Costa Rica Lim—n: 20 m, 10.35N 83.32W, 27 Apr. 1995, Herrera , G. 7807 (CR, MO). Costa Rica Puntarenas: 200-350 m, 8.25.30N 83.19.00W, 18 September 1990, Abelardo Chacón 1062 (MO). Costa Rica Puntarenas: Corcovado National Park,, , Liesner 2922 (MO). Costa Rica Puntarenas: Cerro Osa, 326 m, 08.25.30N 83.19.00W, 18 Sep 1990, Herrera 4315 (MO, CR). Costa Rica Puntarenas: Rincón, 350 m, 08.42.50N 83.31.42W, 17 July 1990, Herrera 4289 (MO, CR). Costa Rica Puntarenas: 250 m,, 6 August 1991, Juan Marín 95 (MO). Costa Rica Puntarenas: 50-150 m, 8.42.20N 83.31.30W, 5 August 1991, Reinaldo Aguilar 190 (MO). Costa Rica Puntarenas: 50-150 m, 8.42.20N 83.31.30W, 10 August 1991, Reinaldo Aguilar 227 (MO). Costa Rica Puntarenas: 08.42.01N 83.30.48W, 11 September 1996, Thomas B. Croat & Dylan Hannon 79317 (MO, US, WU). Costa Rica San José: 460-520 m, 09.45.00N 84.33.30W, 26 June 1985, Michael H. Grayum, Richard Warner & Pam Sleeper 5493 (MO). Costa Rica San José: Reserva Biológica Carara, 300 m, 09.45.40N 84.31.50W, 2 Oct 1990, Zuñiga & Varela 290 (MO, CR). Costa Rica San José: Cerros de Puriscal, 650-800 m, 09.43.40N 84.23.58W, 17 July 1995, J.F. Morales & J. González 4538 (CR). Panama Bocas del Toro: 590 m, 8.46N 82.14W, 10 March 1985, T.B. Croat & M.H. Grayum 60202 (MO). Colombia :, Dec 1857, Schott 1 (NY).